I’ve always been a big fan of cognates, i.e. genetically related words across languages, like Spanish insistir and English insist. As a language learner, I’ve found cognates enormously helpful in reading and in memorizing vocabulary. I really missed them when I studied Hebrew. As a teacher, I point out cognates and also teach my students to use them just as I do: as an aid in reading and in memorization. An additional benefit is intellectual. Articles in the popular press with titles like “Latin comeback in the schools” invariably make the claim that studying Latin helps students learn the roots of English vocabulary. There’s no reason why students can’t have the same benefit from studying Spanish or other Romance languages. As a linguist, I’m happiest when I learn a non-obvious cognate: the kind that gives you an “Aha!” or “Really?” moment. 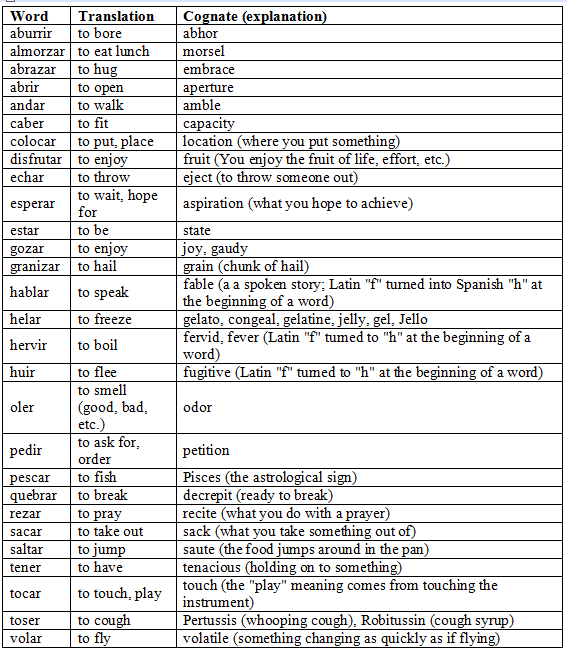 The table below lists my favorite “Aha!” Spanish/English verb cognates. For example, I’ve always explained the verb disfrutar to my students metaphorically, as enjoying the fruits of life (or whatever) — here I normally mime plucking fruit from a tree – but until I looked it up I didn’t realize that this was the verb’s actual etymology. Again, I’ve left out what I consider to be more obvious cognates, such as savvy, savory, or homo sapiens for saber, cognitive or acquaintance for conocer, or dictate for decir. [There, I worked them in anyway!] My sources for the table are the etymologies on the Real Academia website and Douglas Harper’s very impressive Online Etymology Dictionary, which is great fun to browse. Please write in with your own favorite cognates, including cognates for nouns and adjectives. This entry was posted in From Latin to Spanish, Learning Spanish, Vocabulary and tagged cognates, Spanish, Spanish-English cognates on 29 August, 2013 by jhochberg. I also remind students that “abrazar” has the word “brazo” in it. I love your background! The yellow, especially, makes it very hard to read. Thought you’d like to know :). Thanks for your comment. In this post I wanted to focus just on connections between Spanish and English rather than between words in Spanish (like abrazar/abrazo, which is a really useful one). My favorite in this category is desayuno. I never know until I looked up the etymology of desayuno that ayunar means “to fast”, so the Spanish and English words actually have a similar origin. I’m confused, though, about your feedback on the blog’s new background. You love it — but the background makes it hard to read the blog? Sounds like a problem. On my screen the central white part stands out nicely against the bright background. One time I was trying to teach a Russian Deaf man some English. Being profoundly deaf as an infant, Russian was more like a second language and all written/spoken languages were difficult for him as with most profoundly Deaf people (esp. when most hearing parents do NOT expose them to language that they can understand – visual language – SIGN, but I digress). I had a Russian friend who taught me all the cognates he had discovered when he learned English. It helped the Deaf man greatly. One of the cognates also exists in Spanish – Rule Wheel la rueda The wheel “rules” as in directs the vehicle. I, too, love cognates. Also, you are right about any romance language helping us to learn about our native English. Many components (just saw “poner” in that word just now) I never saw until learning Spanish, like “gust” in Disgust and With Gusto when I learned gustar. Thank you for your list. Thank you for your insight about Russian. I’ve never studied the language, but it should have a decent set of cognates with English since they are both Indo-European languages. However, I would expect this set to be significantly smaller than that of English/Romance cognates because so much of our vocabulary comes from French, thanks to the Norman Conquest. As for rule and rueda, that’s a clever mnemonic but not actually a pair of cognates. Rule comes from Latin regula, and rueda comes from rota. I’m glad you like the list! I never realised this for years, and could never get the vowels in the right place until I say the word menacer in French. Then the link became apparent. This is a nostalgic one for me, since one of the first French words I learned was sauter.